Lily Pads of Loveliness - Stop staring and start sewing! I couldn't help myself. I had to play with some of this Ginger Blossom fabric. It's so soft and the colors are so great. I used an old pattern (oldie but goodie) that I've had for over 10 years. It's out of print now but I bought one on ebay recently (I see there's one listed now) because I wanted the smaller size ranges too. It says it takes 2 hours to make it but after you've made it once you can probably do it in less than an hour, it's so simple. 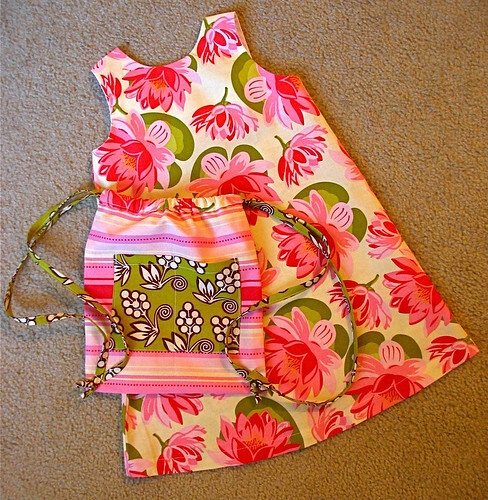 The dress and blouse have 4 pattern pieces: 1 front piece and 1 bodice lining, 1 back piece and 1 bodice lining. This lily pad print is so great on it's own I thought it would be a shame to use it in a "busy" outfit. I think it turned out perfect. I really love the little backpack too. It's really fun to make and darn cute. 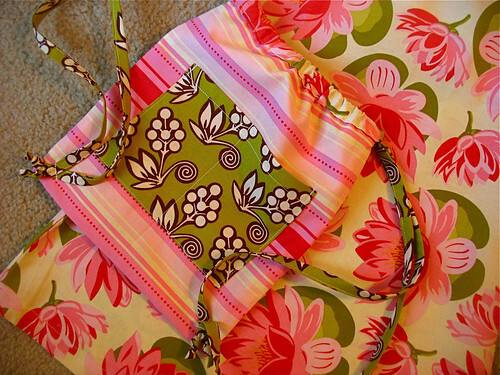 The pattern only has a few pieces: an outside piece and lining, then a pocket and two straps. Easy Peasy, just a bunch of rectangles. 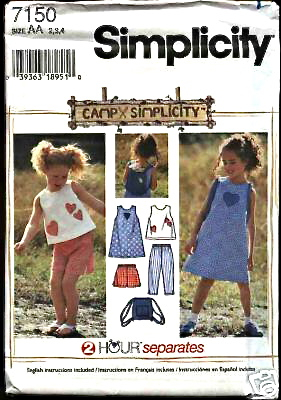 I keep meaning to make a copy of this pattern but in a bigger size because I think it would be fun to have one for myself. Cute! Oh, and I found the cutest blog today. Look at her sewing room! The shelves, the chair...heavenly. Oh another thing, I recently changed email servers and it looks like I lost some of your emails in the process so please don't think I'm ignoring you. Because I like you! I really like you! It looks like we've got it worked out now.